At this site we will publish news, newsletters, and workshop information of the CAP4Access project. There are to be two international workshops over the course of the project. The first one was held in Madrid in 2015 and the second one will take place in 2016. Participation will be by invitation. The first international expert workshop was held in the context of the 5th International Congress on Tourism for All in Madrid on 23 September, 2015. It was a major event for the accessibility community in Europe and beyond. It presented key achievements of the project and discussed them with representatives of stakeholder groups that are of major importance to CAP4Access. The workshop sought, in particular, to contribute to an exchange and deeper understanding between two major groups of stakeholders; firstly technology developers and providers of data infrastructure (including the OSM community); and secondly end-users of information on accessibility of the built environment, such as wheelchair users and other people with limited mobility. The first session of the workshop (23/09/2015, 17:00-19:00) was open to anybody interested in discussing with the team, while the second day session was reserved for discussion between the project team and the advisory board of experts. For further information, contact karsten.gareis(at)empirica(dot)com. 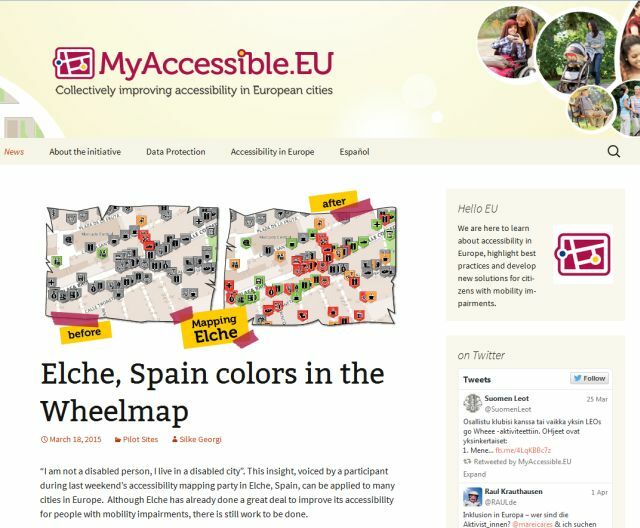 You can find a comprehensive list of news about the CAP4Access project at the website http://myaccessible.eu which is dedicated to promoting project findings to interested people. We will produce two newsletters a year, informing about current developments within the project. If you wish to be included in the mailing list, please contact info(at)CAP4access(dot)eu.